Camp Merritt, originally camp Tenafly, was named after Major General Wesley Merritt. Over one million soldiers passed through the camp as it was known as the “Replacement Depot” for troops sent to France. To honor those who gave their life, “The Monument” was built and today stands at the intersection of Knickerbocker Road and Madison Avenue. 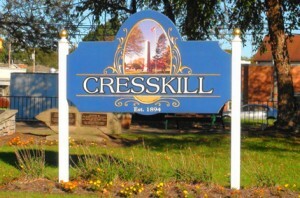 Cresskill offers ample parks such as Merritt Field Park, 185 Piermont Rd, and Brookline Park. A nice shopping district offers a variety of stores. Some of the restaurants in the area include Umeya’s, Samdan, Griffins Bar & Eatery, Hanami’s and Golden Garden Chinese Restaurant. There are two kindergarten schools in Cresskill, Edward H. Bryan School (kindergarten through 5th grade) and Merritt Memorial School (pre-k through 5th grade). Thereafter, children attend Cresskill Middle School from 6th through 8th grade and Cresskill High School 9th through 12th grade. New Jersey Transit serves bus routes to The Port Authority Bus Terminal. Rockland Coaches also serves The Port Authority Bus Terminal, as well as the George Washington Bridge.